"This is a recipe passed down from my great-grandmother, with a few shortcuts she approved of." Bring a large pot of water to a boil. Cook cabbage in boiling water until outer leaves pull away easily from the head, 3 to 5 minutes. Separate leaves and let cool. Reserve 1 1/2 cup cooking water. Heat oil in a large skillet. Add onion and garlic; cook and stir until translucent, about 5 minutes. Stir in wet rice; cook and stir until moisture evaporates, about 1 minute. Remove from heat and let cool, about 5 minutes. Mix beef, sausage, and egg together in a large bowl. Stir in cooled rice mixture. Place a golfball-sized amount of the beef mixture on the ribbed end of a cabbage leaf; roll up, tucking in the sides. Repeat with remaining beef mixture and cabbage leaves. 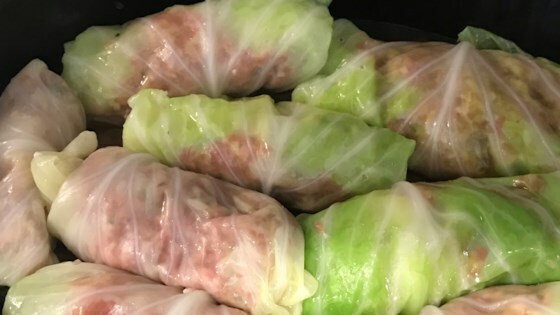 Place rolls seam-side down in a slow cooker. Cover with tomato juice. Pour reserved cooking water on top. Cook on High for 30 minutes. Switch to Low and cook for 6 1/2 hours. Substitute vegetable juice for the tomato juice if desired. If cooking on the stove, boil in a large pot for 30 to 45 minutes. This is very good. I always add a teaspoon full of Allspice to my sauce. Its very subtle, and delicious. People taste and say "What is the mystery flavor? We love it!"